San Diego beach communities are the ideal vacation destination. Whether your idea of the perfect vacation is tanning on the beach, surfing, sailing, water skiing, shopping, bar hopping or sight seeing, San Diego is an ideal destination. Mission Bay is the center of water activities in San Diego and from your vacation rental you can easily arrange to rent anything from kayaks to speed boats for your adventuring needs. Mission Beach offers surfing year round with larger waves in the winter, but cleaner conditions and warmer water in the summer. Click here to explore the area. 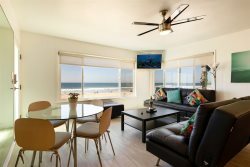 Our vacation rentals also offer convenient access to the world famous reef breaks of La Jolla and Sunset Cliffs as well as such famous breaks as Tourmaline Surf Park, Wind and Sea Beach, Bird Rock and much more. Nearby shopping includes Belmont Park with the world famous Giant Dipper roller coaster built in 1925, Seaport Village, Horton Plaza and numerous boutiques along Garnet Avenue in Pacific Beach. Nearby hiking includes Cowles Mountain, Cabrillo National Monument and Torry Pines State Park. Also, for history buffs, San Diego is home to the first Mission in Alta California, Mission Basilica San Diego de Alcala. Old Town San Diego is home to even more history offering a look at San Diego and the wild west long ago. Mission Beach is the stretch of land or sandbar between the Pacific Ocean and Mission Bay. Among the many qualities that make Mission Beach such a great vacation destination is that you are never far from the beach or the bay and you can walk just about anywhere with the community on the ocean front boardwalk or the bayside boardwalk. Mission Beach has plenty of restaurants, bars and nightlife offering a wide array of choices from fast food to fine dining and hole in the wall bars to multi-level beach clubs. The majority of our vacation rentals are in Mission Beach (Ocean Front Walk) or Mission Bay. We offer everything from basic San Diego vacation rentals to luxury vacation rentals and beach houses. The beach front and the oceanfront boardwalk offer a livelier atmosphere while the bay front units offer a more tranquil environment. San Diego is home to some of the world's most famous parks including Sea World, The San Diego Zoo, The Wild Animal Park and Lego Land. All are easily accessible with Sea World in particular being located within Mission Bay Park. RESERVE YOUR TICKETS HERE BEFORE YOU ARRIVE! Looking for things to do in San Diego? 101 Things To Do has articles on activities, attractions, shopping, and dining while your visiting Americas Finest City.